Get the career that is right for you! Now that you know who you are meant to be, learn about the types of careers that are best suited for you and the kind of environment that will support you to achieve your potential at work. These 24-page reports are invaluable for anyone considering career options or wanting to make the most of their current job. This report will help you to understand the elements of work that are most intrinsically satisfying versus those that are more likely to frustrate you. 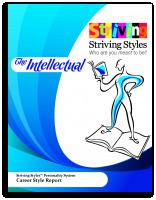 Build awareness of your career style, what motivates and how to get your predominant needs met through our career. Using the information in this report, you can make choices that are most likely to move you in the direction of the career and future you desire. Plan for your job search and prepare for interviews. My need to be in control was fostering dependency in my daughter. Now, I let her help out and give her more responsibility. No more power struggles!"